Table manners for dogs are a somewhat disputed subject among many dog owners. Some have the opinion that it’s OK to have your beloved furry bundle at the table – after all, they are a part of the family, while others state that dogs shouldn’t be allowed anywhere near during mealtime. In any case, you should consider the fact that you might have some guests for dinner that could find the presence of your dog begging for scraps around the dinner table annoying and by then it’ll probably be too late for you to try and correct his behavior. As with many other life lessons with our beloved pets – it all revolves around consistency and routine. If you accustom them to behave a certain way while you’re eating, they will find it normal and positive behavior – after all, they are getting rewarded for it by the delicious goodies right of your plate or a fun time with their toys away from the table. If you let them do what they want one day and get mad at them for the same thing the next our trusty companions won’t understand what they’re doing wrong. The point is that you should treat them the same every time no matter what you decide is best – having them around or not. 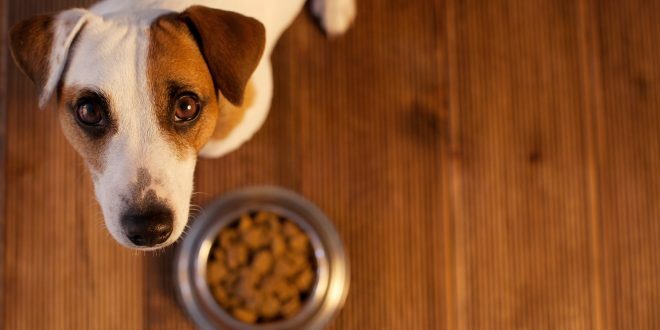 A lot of things in your beloved four legged friends lives revolve around food. It’s of utmost importance to them – after all, you even modify their behavior with it through treats for a job well done. Therefore it’s very important that they know when they can expect their next meal. No matter how many meals you give them through the day make sure that you give them at the same time every day. For instance always at 9 AM and 6 PM. This way, although they can’t really tell time, their biological clock will tell them when they can expect some yummy grub. Not knowing when they are going to eat next is one of the biggest reasons for their possible inappropriate table manners and knowing that food always comes at a certain time of day is a great reassurance for them. Of course, there are some dogs and breeds like Jack Russell Terriers (khm, khm Kala) that are especially prone to overeating. You’ll have to take great care of their daily calorie intake which is hard if everybody at the table gives them a pinch of this and a little bit of that. That means that you can’t let them fool you with their cute eyes, a wiggly tail or soon you’ll have a four legged barrel rolling around your living room. Trust me, they can get pretty insidious if they smell something to their liking. Resist the urge and just say no! It’s in their best interest, even if they don’t know it themselves. If you do succumb to their charms make sure that their own meal is adjusted according to how much they already ate beforehand (taking into account their activities in between). The best way to get rid of bad habits is through patient training and positive reinforcement. As we’ve pointed out numerous times before – negative reinforcement is not only cruel but ineffective and detrimental to your relationship. There are a few ways to solve your conundrum. The easiest is simply physically removing them from the vicinity of the table during dinner time. For instance, they could spend time in the yard or in their crate with their favorite toys while you are in the dining room having your meal. However, this way you won’t really deal with the problem directly – they’ll still have an inclination to beg for food if you don’t separate them physically from the dining area. That could lead to problems for you and other guests if you find yourself dining out, for instance in a restaurant. The waiter will surely be more inclined to let you dine with your dog in tow if he sees that your pet is well behaved, isn’t making a mess or bothering the other guests. Proper training may take more of your time but will make a lasting impression on your beloved companion. One approach is the application of clicker training techniques. If they mastered the sit and stay commands your life should be much easier – they already associate such calm behavior with good things. You just have to reinforce it during dinner time. You could even designate a spot where you want your pooch to be during your meal. In this instance physical distance isn’t crucial for your success – you can pick the other side of the garden as much as a place right by your side. Make up a special command just for that place and time and reinforce the behavior that you want with a positive attitude, lots of praise and treats and ignore the bad behavior. Treats mustn’t come from your table. If they behave especially nicely you can reward them by putting some of your food that you think they’ll love in their bowl after everybody else finished eating. Don’t give them anything from the table at the table while everybody’s eating. They have to understand that they will be generously rewarded for their exemplary behavior after the fact. Having dinner with while those cute balls of fur are around can sometimes be a real adventure, but it’s not worth dreading about. Help them understand that being a nuisance just doesn’t pay off and they’ll be happy to change. What do you think about having dogs around your dinner table? If you have some fun anecdotes, questions or suggestions we’d like to hear them in the comments below.